Interconnected wireless devices could be in for a huge uptick in efficiency if chip manufacturers have anything to say about it. Companies worldwide are gearing up to make microprocessors that feature tiny solar cells. The new chips are expected to achieve conversion efficiencies as high as 80 percent. These super chips will be needed to power what’s known as the Internet of Things (IoT), which are the tiny embedded sensors streaming information from machinery, automobiles and household appliances to networked servers. Materials science is going full bore to exploit the sun’s limitless supply of energy. The solar cells on rooftop panels use only one type of semiconductor to convert sunlight into electricity. The new super cells employ four semiconductors to absorb more energy from the entire solar spectrum. Startup, Semprius recently unveiled a four-semiconductor cell that delivers efficiencies exceeding 44 percent. Chipmaker, Soitec last year produced a four-semiconductor cell that it expects will reach 50-percent conversion efficiency. Engineers at MIT are “aiming for the moon” with a chip that will deliver conversion efficiencies in the 80 percent range. 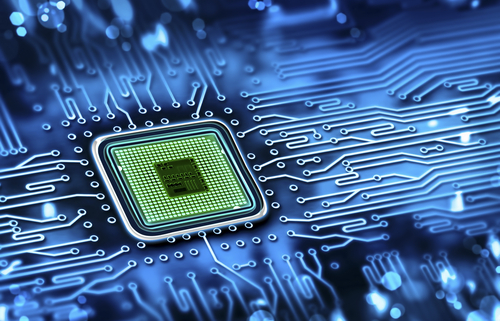 The tiny chip takes up very little circuit “real estate,” measuring just 3 x 3 millimeters. It features a single inductor circuit that monitors when to power an IoT device, charge the battery, or perform both functions. The new chip even operates a number of switches that control current flow to ensure maximum efficiency. By 2020, there may be as many as 50 billion devices worldwide connected to the IoT. To ensure they “talk to each other” will require new ultra-low power sensors capable of running for months at a time without the need to change batteries. Solar powered chips provide the ideal solution. These super efficiency chips can deliver the power needed—anywhere from 10 nanowatts to 1 microwatt — for tomorrow’s IoTs. Scientists at the Stanford Institute for Materials and Energy Sciences are in the process of creating a solar-energy device that’s roughly 100 times more efficient than earlier devices in converting sunlight and heat into electricity. Based on the Photon-Enhanced Thermionic Emission (PETE) process, the new device draws on more of the sun’s spectrum of energy—including wavelengths that generate heat. The PETE chip features a sandwich of two semiconductor layers: one that absorbs sunlight to create long-lived free electrons; another to emit freed electrons so they can be converted to electrical current. Researchers are looking at ways to make these devices 10 times more efficient via new coatings that maintain the second layer’s atomic layout as temperatures rise. It’s the future of Internet mobile devices: create a light-powered chip that keeps devices running without draining batteries and getting that annoying “low batt” light. A company called Sol Chip is working on the solution: their new chips will feature windows on the surface much like those found on EEPROM memory chips. The big difference will be that the solar chip windows will light up the photovoltaic device and power the chip. Imagine the flexibility here: being able to power the smallest mobile devices (Bluetooth, headphones, smartphones) virtually forever without having to worry about replacing those tiny (and expansive) button lithium batteries. The concept behind the new Sol Chip seems like a no brainer, which is why companies are pulling out all the stops in bringing them to market. From tiny chips that increasingly harness more of the suns power for the growing world of IoT to the hectare-size solar farms that power a city, solar is making inroads in every facet of our existence.